Took the 2-1/2 hour trip up and back on the Mt. 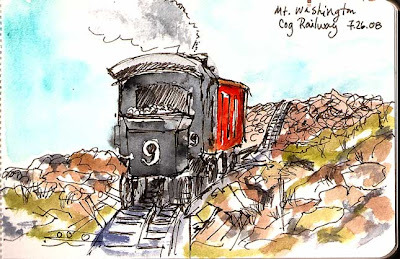 Washington Cog Railway in NH on Saturday. We rode in the train with the biodiesel engine, but we got to see the traditional steam engines puffing away. It was quite a warm day, even in the White Mountains, but it was rather chilly at the summit!